Rexall Sundown prides itself on providing a supplement that can help women during the transitional stages of menopause. Utilizing the health benefits of Black Cohosh, this supplement aims to promote menopausal health while reducing the symptoms of occasional sleeplessness, mood changes, and hot flashes. However, due to the fact that there are many menopausal supplements on the market, should this one truly be ranked as highly successful? To answer this question, let us delve deeper into the mechanics of this product. According to Rexall Sundown, 1 tablet of Black Cohosh should be taken every day. It should also be noted that Black Cohosh can be opened and prepared as a tea for those who do not wish to consume tablets. Black Cohosh can be purchased on Amazon for $8.63. With this purchase, customers will receive 100 tablets. This is approximately a 90 day supply. It should also be noted that when purchasing this product, customers will receive free shipping, thus cutting down on cost. After reviewing this product, it has been concluded that no guarantee accompanies Black Cohosh. A company should always provide some form of a guarantee with their product as this creates a safety factor for all customers. In conclusion, although this product by Rexall Sundown has enjoyed success among customers, there are several elements which have arisen from research that should be of concern to future users. The first concern is the benefits. 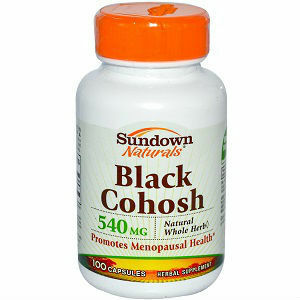 Although Black Cohosh does help relieve some of the symptoms of menopause, this product leaves other symptoms untouched. Because women will only find relief for half of their symptoms, other medications and supplements will have to be sought, therefore increasing the daily intake of tablets. The second element of concern is the guarantee. Because Rexall Sundown does not provide a guarantee against void successes and dissatisfaction, new customers are essentially risking their money on a product that may not provide them with the relief they so desire. Jackie Horowitz	reviewed Rexall Sundown	on November 9th	 and gave it a rating of 2.